Our challenge at Winter Wonderland this week is another fabulous sketch. This one has been designed by our lovely Pascale. A reminder for next week about our fabulous BLOG HOP!!!!! We've got some amazing prizes planned .... so don't miss it!!!!! All products are Stampin' Up! unless otherwise stated ..... The image has been watercoloured using the Aqua Painter and Stampin' Up! ink pads. Don't forget to check out the other DT's lovely creations this week! Aw - what a cute little mousey! Another stunning card Teri - love the HM image and those fabulous swirls. awww .. such adorableness in the extreme! 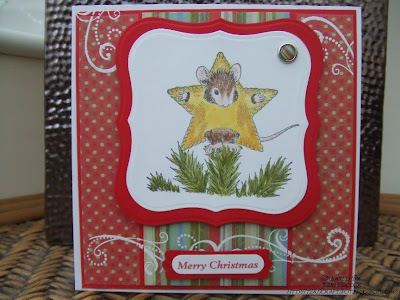 I adore house mouse and you've made a fabulous card. outstanding coloring the colors are perfect and I love that paper!! Winter Wonderland - #36 BLOG HOP!!! GDT - Anyone For Anya? Sale-A-Bration - From Stampin' Up!